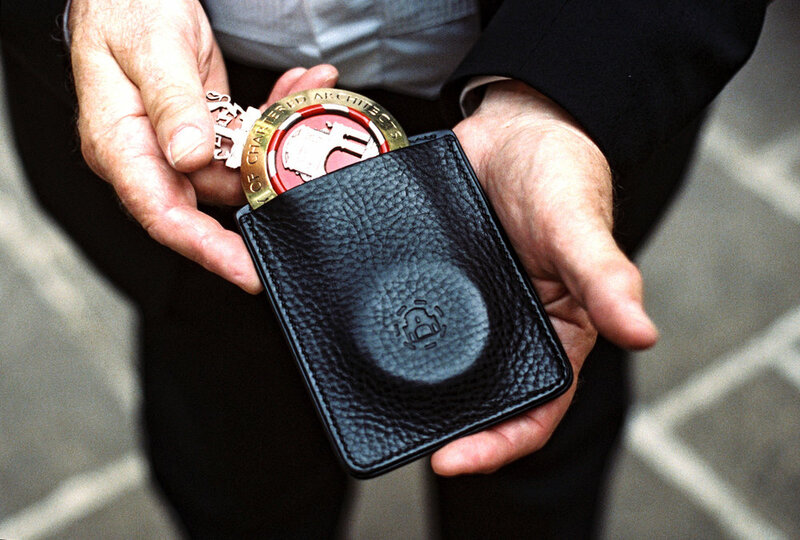 This pouch was commissioned by Peter Murray, the Master (2016-2017) of the Worshipful Company of Chartered Architects, one of the City of London's livery companies, as his gift to future Masters. It is designed to carry the Master's Badge, a physical symbol of the association worn by the Master on ceremonial and important social occasions. The brief was for a pouch that would slip easily into a jacket pocket, protect the delicate metalwork and last a hundred years. The badge - and now the pouch too - will be handed from Master to Master as each comes to the end of their term. Embossed on the front is the Company's logo - a simplified rendition of Temple Bar, the large stone archway (designed by Christopher Wren) built to mark one of the ancient entrances to the City of London. As Temple Bar was the gateway closest to the Royal Palace, it was the point where monarchs would stop to request permission to enter the City. This ceremony - re-enacted to this day - is a reminder of the often delicate relationship between City and Crown. The pouch was crafted using two types of Italian leather; a firm, burnished 'bridle' leather for the core and a softer, more flexible 'bubble' leather for the sleeves themselves. It was hand-stitched in beeswaxed French linen thread, Lin cablé noir #432. 113 saddle-stitches and 6 doubled whip-stitches, all pulled by hand. To be kept informed of future projects such as this one, consider subscribing to the Newsletter.